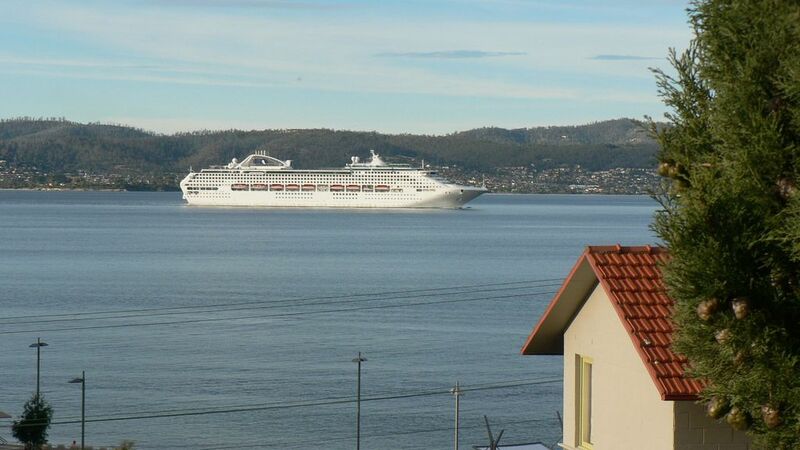 Luxury one bedroom apartment with superb views of the River Derwent, situated 2.5 km (about 3 minutes by car) from Wrest Point Casino and only 4.5 km (about 6 mins) from Salamanca Place on Hobart's waterfront. With a queen-size bed, the decor is contemporary, with dimmer controlled up-lights in all main rooms. The kitchen is well equipped with stone bench tops and splash backs, Miele dishwasher, soft touch ceramic cook top, full sized oven, microwave and two door refrigerator. Much of the furniture, including the dining table, dining chairs, bed head and bedside tables, has been custom made for the apartment by a local craftsman from myrtle, a beautiful Tasmanian minor species timber. We also have a similar one bedroom apartment right next to Riverview in the same small block. It is now available for bookings. If you are looking for accommodation for two couples, or your dates are not available at Riverview, please contact us. Long Beach is about 100 metres - look straight down it from the window. Nutgrove Beach is around the point at the end of Long Beach. Both are suitable for swimming. Michael was very helpful in all respects. Immaculate property, with all bells and whistles. Michael’s apartment is extremely comfortable and well fitted out. It’s very well located, only a short walk to the bus stop into the city, and over the road from the river and the beach. Parking is a bit of an issue for anything other than a small car, but we had no problem parking in the driveway. Overall, an extremely pleasant place to stay. Overall a great little apartment! Great view of the city and bay area. Quick access to beach and shops. Had to park on the street as parking doesn't really suit medium to large cars. Only major issue we had was little ants everywhere in the bedroom. Got into our clothes and bed. Excellent place to stay. All you could need (except a frying pan). Brilliant views from the apartment. Very very tight parking and steep walk up to apartment with cases. Heaters look inefficient but they work brilliantly. Very small but quite manageable for our 4 day stay and a great base for seeing Hobart etc. Probably not ideal for the elderly because of the steep walk and also have to climb in and out of deep bath for shower with no bar to hang on to for the climb out. Heated towel rack so lovely. Exhaust fan in bathroom could use replacing as totally inefficient. Bed way to soft for us but some would like it. Right hand side of couch very sunken - could used a good stuffing. All just little things. Would definitely stay again and compared to the dump we stayed in at Strahan that we paid even more for it makes this beautiful apartment very very reasonable. The one big thing that annoyed me was that HomeAway/Stayz charged us a massive booking fee which we were not expecting. Perfect apartment with great view. As returning guests, we always enjoy our stay here. The apartment is always spotless with quality homeware and linen. All this and a great location with views. We really enjoyed the Riverview apartment - it felt cosy and well resourced, much warmer and more inviting than other options we used on our holidays (especially serviced apartments, which where basically functional and cold). We really appreciated that it was a real kitchen that you could cook in, and it was a great touch to have some food such as balsamic vinegar available, something that a lot of other places could learn from. The extras gave us travellers some new options for meals, so thank you. The footstool was also a thoughtful touch - we could access all the cupboards! These little additional things really made our day - and were a sign of the thought the owners had gone to, so we appreciated their generosity. The only challenge was the parking, but patience was the key there and we got the hang of it pretty quickly.